Scholl Flight Socks Review - Best Compression Socks? BackpacksEasy to carry and with so many different styles, the backpack is considered to be the best type of bag for travelling. Here are all the best backpacks, including laptop, hiking, business and waterproof backpacks. Hand LuggageLarge enough for weekend trip yet small enough to be carried onto airplanes, the best hand luggage is durable, fashionable and have many compartments. HoldallsHoldall bags are ideal for short trips and weekend getaways, as well as the gym and daily activities. Here are the best holdall bags for casual and formal travel. Laptop BagsNo matter if you’re carrying a laptop for business or pleasure, it needs to be kept safe and secure. Here are the best laptop bags for casual and business travel. Luggage AccessoriesThe best luggage accessories can add convenience and security when travelling. Locks, straps, scales and trolleys among other essentials, will all come in handy. Pouches and WalletsIn certain areas, the type of pouch or wallet you carry can make all the difference between being safe and being in danger. Here are the best pouches and wallets to conceal money, passports and other sensitive information. SuitcasesImagine maneuvering around airports and hotels with such speed and ease without worrying about if your suitcase will hold up to bumps and knocks. Fortunately, the best suitcases guarantee this experience. Toiletry BagsBrushing teeth, make-up and grooming, all things one must do frequently. The best toiletry bags will store your toiletries so you can easily access them every morning and night. 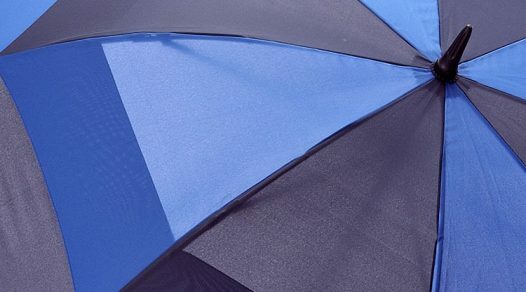 Waterproof BagsRain and water is a gift from mother nature, but it’s frustrating and costly to have all your small accessories soaked, especially electronics. Here are the best waterproof bags to keep them from contact with water. Hydration and DrinkingKeeping hydrated is vital, especially for arduous trekking and hiking. Here are the best hydration accessories including drinking flasks, bottles and water filters. 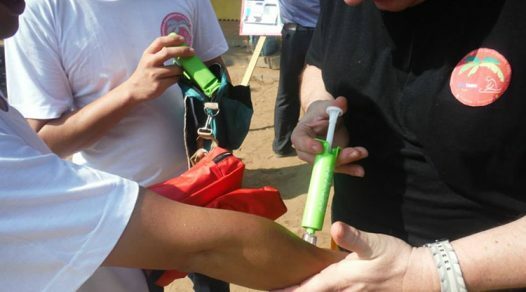 Insect Repellents / ProtectionInsects can be a real nuisance at best, and a hazard at worst, particularly the mosquito. 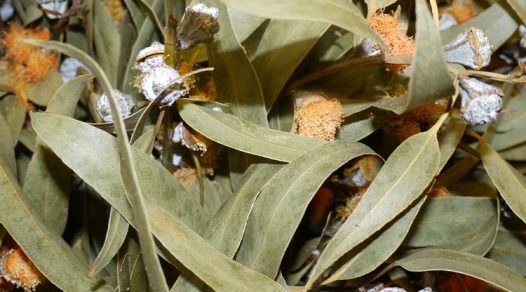 Here are the best insect repellents and protection to keep the critters away. SleepIt’s no fun being deprived of sleep. You should be full of energy to fully enjoy the adventures and excitement of travelling. Here are the best sleeping accessories to ensure you have a good nights sleep. ToiletriesIt’s annoying when you arrive at a hotel only to discover that no toiletries have been provided. Sometimes, it helps to bring your own, and taking the best toiletries with you on your travels ensures that you never have to worry about not being able to take care of personal hygiene. 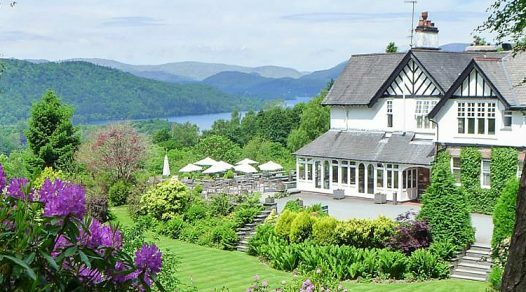 DestinationsAre you seeking new holiday destinations that will spring some new inspiration and excitement into your life? Good. Here are some fantastic ideas that will make you proud to say “I’ve been there!”. Travel TipsIt’s easy to get lost in the hustle and bustle of hectic cities and everyday travelling. This section provides you with essential travel tips that every traveller should keep in mind before they set of on their trip. Product ComparisonsHaving trouble deciding what travel essentials to buy to accompany you on your trip? Check out our side-by-side product comparisons to help you make an informed decision. Product ReviewsIf you want a more detailed guide of a particular travel product, then our product reviews section is the right place. We’ve done the research so you don’t have to. Many of the travel products we review, we have tested and used ourselves, so you can buy with confidence. Prevents blood clots and ensures a more comfortable journey. When we travel, we often don’t think about our health on these long journeys. We often find ways to pass the time before we reach our destination. We should think about what it can do to our bodies when we remain still for so long particularly on flights. One of the leading brands in foot care, Scholl, has produced Scholl flight socks aimed at reducing the risks associated with long journeys and immobility. But what can flight socks do for us? Can’t we just wear normal socks? Read on to find out the importance of flight stockings. Antimicrobial Protection: Feet stay fresh and cool to prevent odours. Reinforced Toe: Prevents your toes from tearing a hole in the sock so it will last longer. Graduated Compression System: Improves circulation which helps to prevent swollen ankles and aching legs. 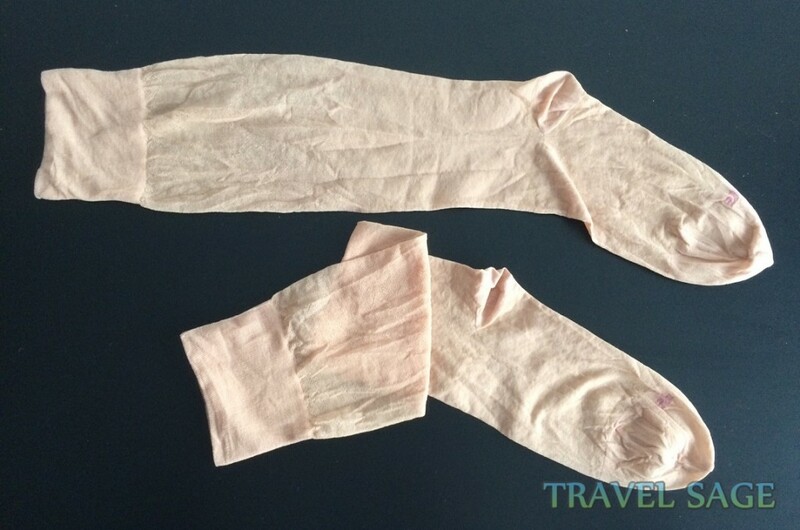 Prevents DVT: Risk is reduced when worn on long haul flights. Delicate Fabric: The material can snag quite easily. 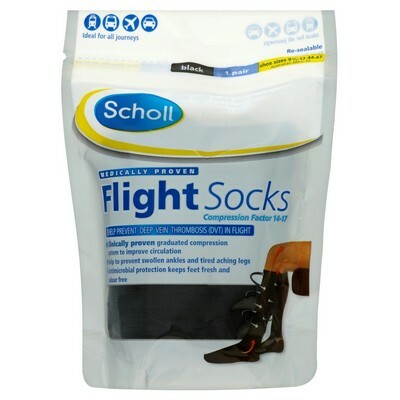 The Scholl flight socks look like ordinary knee high stockings for women but these can be worn by men or women. The difference is not noticeable until you wear the socks when you realise it’s tight around the ankles because of the compression. At the top of the socks, there’s a wide reinforced comfort band which doesn’t dig into your calves. 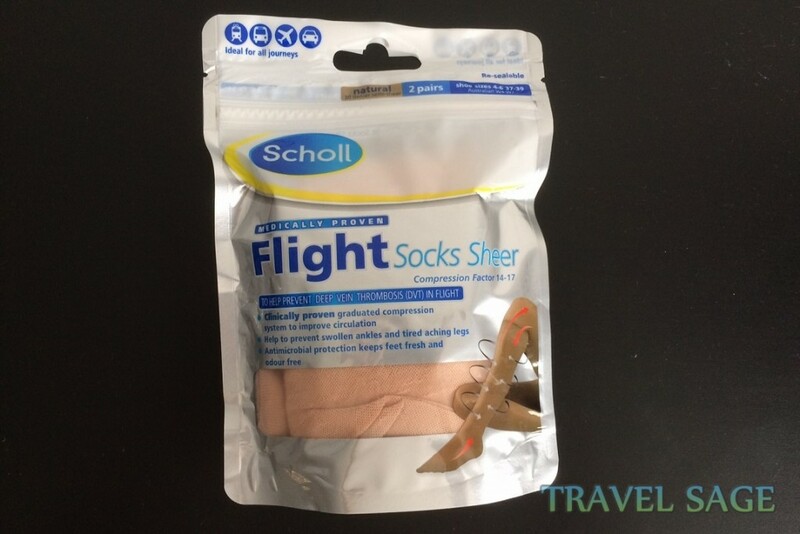 I’ve had flight stockings from other brands before with comfort bands that would loosen after one use but with these Scholl socks, the band maintained its tightness after a few uses. The heel and toe of the socks are also reinforced so it will take a longer time for these bits to wear away. If you usually get holes in your socks in the toes and heel area, it’s because it’s not been reinforced with extra material. How Does the Material Feel? As is usually the case with stockings, the flight socks are made from a sheer fabric consisting of 80% polymide and 20% elastane. It’s fairly thin at 30 denier so you won’t get too hot with them on. The socks felt quite comfortable when I wore it but the material isn’t very soft. It’s a little rough but not enough to irritate sensitive skin. The problem with this material is that it snags, runs and ladders quite easily so you have to be careful not to tug too hard when you put it on. What Colours & Sizes Are Available? There are two available colours for the Scholl flight socks – natural and black. With the black pair, the material is a bit softer due to the cotton feel fabric which consists of 93% polymide and 7% elastane. I haven’t tried these ones but people say they’re softer so feels slightly more comfortable. In the natural colour, there are two sizes available which is shoe size 4-6 and 6.5-8. You get two pairs in a resealable pack. The black colour has three sizes available which is shoe size 3-6, 6.5-9 and 9.5-12. You only get one pair in this pack. Most people said the socks fit their shoe size quite well and there’s a lot of stretch to the compression socks. It’s a better idea to get the next size sock up if your shoe size is on the end of the size. For example, if you’re a size 6, get the next size up because a few people found the socks were a bit tight. Scholl flight socks can be machine washed up to 40 degrees and provided you care for it correctly, the compression level of the sock will remain the same for up to 30 washes. I would suggest putting the socks in a laundry bag to wash due to the delicate material. When we are inactive for long periods of time, fluids in our bodies can build up. It’s worse when we are sitting in cramped conditions and not hydrating ourselves enough. Most often, this is the case on long journeys such as in the car or on flights. 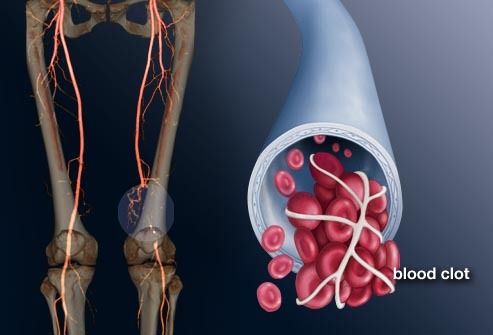 As a result, this leads to circulatory problems and puts us at risk of deep vein thrombosis (DVT). This is where a blood clot forms within a deep vein in your body which is usually in the legs. It can get quite painful and even lead to pulmonary embolism which can be life threatening as it prevents blood getting to your lungs. Scholl flight socks have been medically proven to reduce this risk by improving blood flow. It keeps your legs comfortable and provides relief for swollen ankles and aching legs due to fluid build-up. Who Should Be Wearing Flight Stockings? The above list is not limited so it can include other conditions so if you’re unsure, see your doctor before you embark on a flight longer than four hours. There are other forms of compression hosiery as well if you don’t want socks. There are also compression tights or compression leggings available though they are limited. How Do Flight Socks Work? Circulation in your legs is improved from graduated compression with the flight stockings. This means the socks will exert pressure around your ankles and is gradually reduced towards your toes and the top of the socks. Compression socks will have different levels of compression. 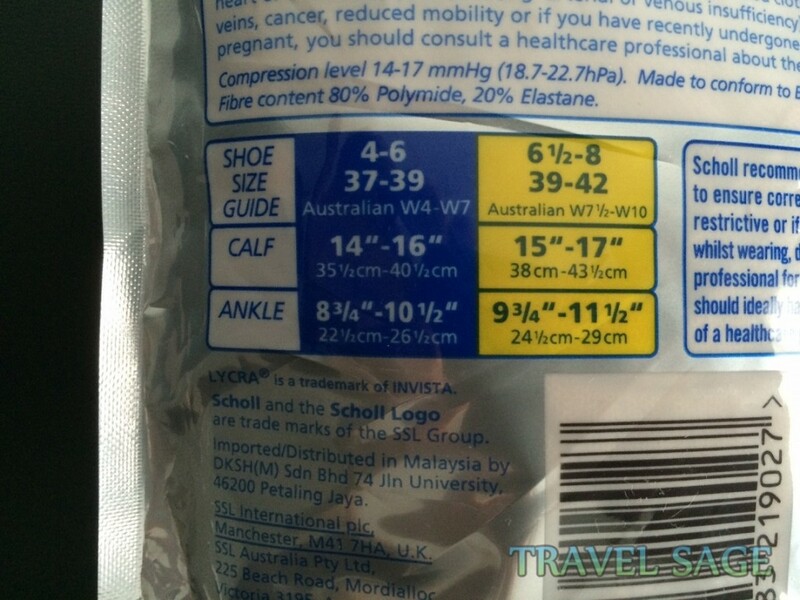 The Scholl stockings have a compression level of 14-17 mmHg which are class 1 stockings. This means the tightness at the ankles is very light. A light compression level is suitable for people who have not developed DVT yet, only at risk of. However, if you have already developed DVT, a higher compression level will be required. Instead of wearing your usual socks, you just wear the flight compression socks. The Scholl socks should be worn just below the knee and you should feel a gentle pressure on your legs and ankle. Don’t be tempted to roll the socks down if they are too long for you. Doing this will cause extra compression to build up so it will get very uncomfortable. The compression socks fit quite well on my feet due even though my shoe size is 3 (UK). There was a slight pressure on my ankles but it wasn’t uncomfortable. For socks, they are pricey but the Scholl flight socks are not ordinary socks. Although they’re more expensive than other brands, Scholl is a trusted and well-known brand specialising in foot care. I’ve had cheap flight socks before and they didn’t even last two trips! Provided good care is taken of these compression stockings, it will last you quite a few trips so it’s a small price to pay in reducing your risk of DVT. I love reading historic novels, baking cakes and traveling to exotic countries! My favourite countries thus far are Greece and Portugal for the food and culture. 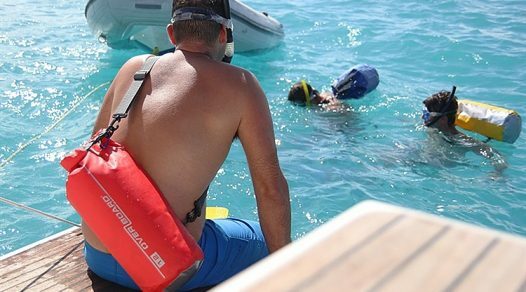 What is the Best Waterproof Bag? At Travel Sage, our aim is to help you prepare for your travels with first class advice on how to remain healthy, safe, comfortable and stress-free during your trip.